Day 1 – Bangalore to Kolkata to Bagdogra to Jaigaon – Bangalore to Bagdogra by 2 flights and then by cab to Jaigaon. Jaigaon is the place bordering Bhutan. The Bhutanese side is called Phuentsholing (pronounced as funt-sho-ling). Day 2 – Phuentsholing to Thimphu – We secured permits at the border and then made it to Thimphu in pouring rain. Day 3 – Thimphu – We spent the day in Thimphu, visiting various places (Dechen Lakhang, Buddha Point, Changlimithang Stadium, Tashicho Dzong), and in general, roaming around. 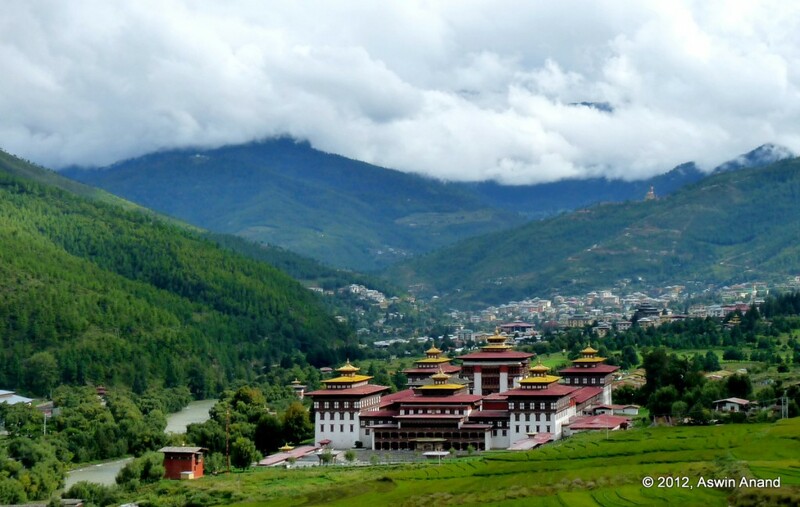 Day 4 – Thimphu to Paro – Apart from Thimphu and Paro, every other area is a restricted area in Bhutan. After extending and securing permits to visit the rest of Bhutan, we left for Paro. 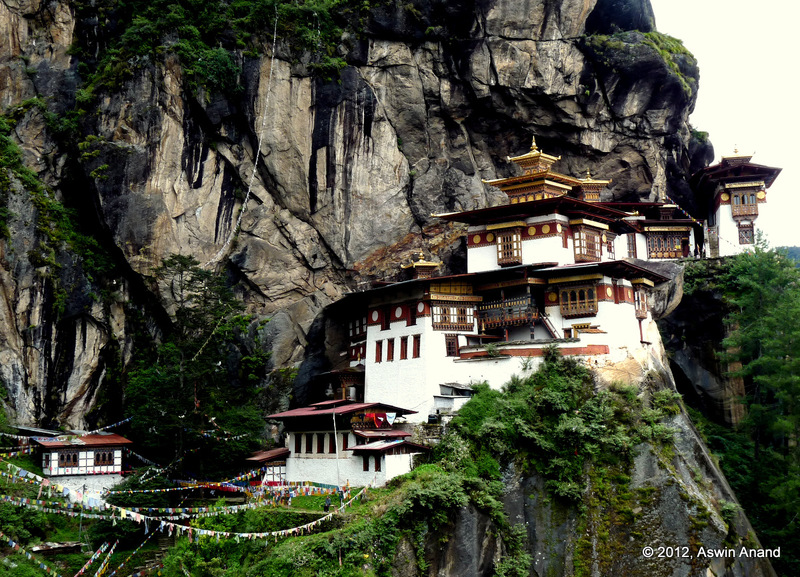 Day 5 – Taktsang Monastery or Tiger’s Nest – Spent the day hiking to (and around) the Taktsang Monastery. A monastery so beautiful and so precariously constructed that, no photo of this place will do any justice. Such is the construction of the monastery that it blends so well into its surrounding. Personally, it was the most beautiful day in Bhutan. 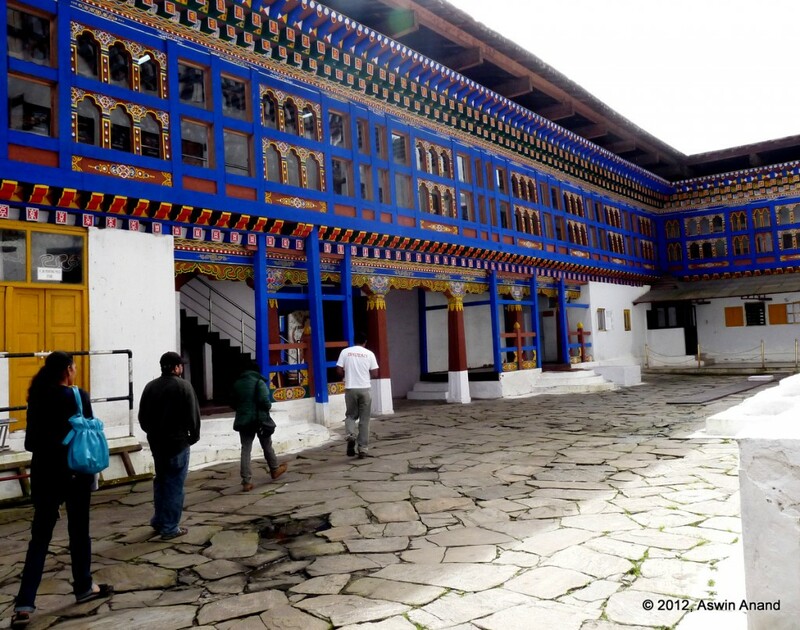 Day 6 – Local touring in Paro – We visited the ruins of Drukgyel Dzong, Kyichu Lakhang, Paro Dzong (also known as Rinpung Dzong) and then the National Museum. Day 7 – Paro to Haa Valley via Chele La – Chele La is one of the highest mountain passes in Bhutan and a very cold one at that. Haa Valley is a very small, cold and beautiful town. The whole town is just a street long. The Indian Army has its base over here. Day 8 – Haa Valley to Punaka via Chukzom, Dochu La – After spending half a day in Haa Valley, we moved to the erstwhile capital of Bhutan, Punakha. On the way we crossed Chukzom; it is the confluence of Paro Chu and Thimphu Chu rivers. From here, the roads split into four directions to go to Paro, Haa Valley, Thimphu and Phuentsholing. Day 9 – Punakha, Wangdue Phodrang – At Punakha, we visited the magnificent Chimi Lakhang (and got blessed with a 10-inch wooden phallus), Punakha Dzong and then the longest suspension foot bridge in Bhutan across the Po Chu. 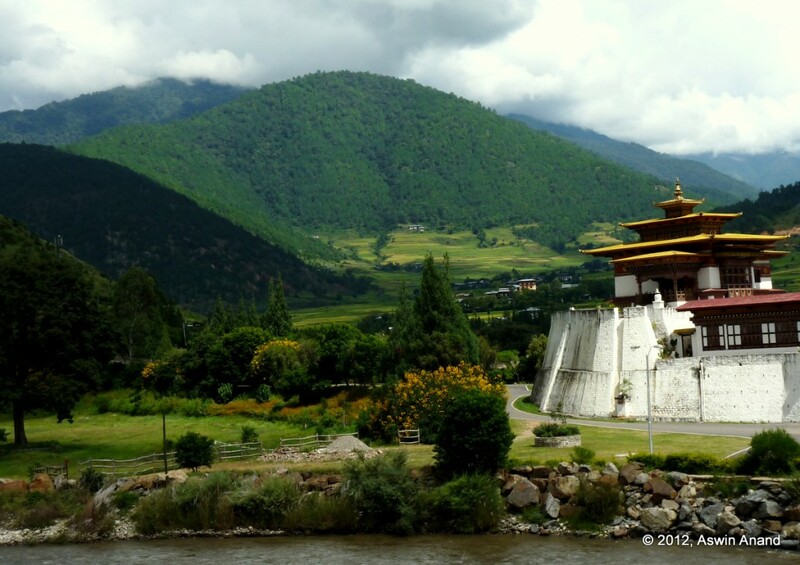 Punakha Dzong is super duper beautiful as it lies at confluence of Mo Chu and Po Chu rivers. The river after the confluence is called Punat Sang Chu. Then, we made our way to the Wangdue’s (pronounced as Wang-di) Tsechu (festival). On the way back, we saw the charred remains of the Wangdue Dzong overlooking the Punat Sang Chu. Day 10 – Punakha to Bumthang via Pele La – Through the most beautiful and picturesque country side, we traveled to Bumthang. There’s a chorten at Pele La. We reached the Jakar town towards evening and walked around. Bumthang is known as Bhutan’s Switzerland. It has gurgling streams and beautiful meadows adorning every bit of it. On the way to Bumthang, we also spotted a centuries old prison. Day 11 – Bumthang touring, Tamshing Tsechu – Early in the morning we visited the Chakar Lakhang, and then followed it up with the Jakar Dzong, Kurji Lakhang and then attended the Tsechu at the Tamshing Lakhang. We walked all the way back to Jakar, sighting the beautiful Bumthang airport. Day 12 – Jakar to Kurji to Thangbi to some village to Ngalakhang and some villages beyond by mountain bike – Two of us spent the whole day mountain biking in the villages of Bumthang. This day was splendid. Some steep uphills followed by some steep downhills, following the Bumthang Chu, school girls for company early in the morning … Whoa! It was one perfect day. We slept with sore bums but the experience was totally worth every bit. Covered about 60 kms in all, of which more than 40 kms were just broken roads and big stream rocks. We reached the end of human settlements beyond Ngalakhang :D. The temple at Ngalakhang and its cold water was superb! Day 13 – Bumthang to Thimphu via Pele La and Dochu La – A 12 hour drive through some of best landscape nature has to offer. Waterfalls at every turn. On a seemingly distant mountain, a small patch would be visible with a monastery or a farm, defying all logic of how someone actually got there in first place :). Shopping in Thimphu after the Thimphu Tsechu. 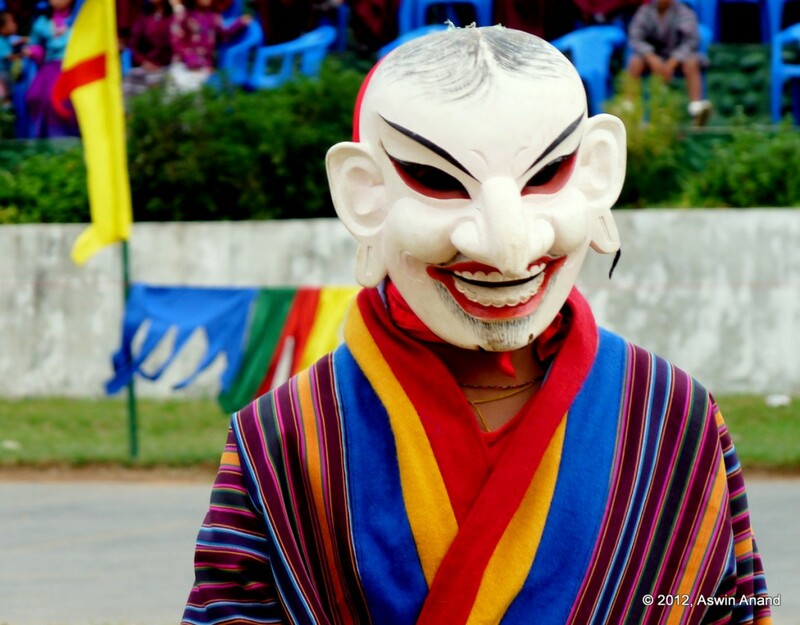 Day 14 – Thimphu to Phuentsholing and then to Siliguri – Culture shock as we crossed the border into India. 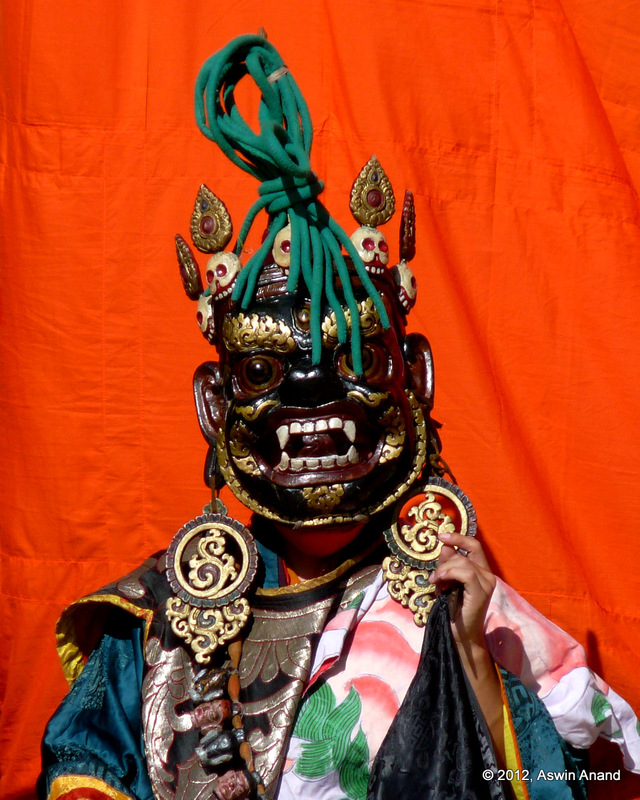 I wanted to rush back into Bhutan and stay there for another year or so. Day 15 – Siliguri to Bagdogra to Kolkata to Bangalore – Home sweet home! At Thimphu, not a single person smoked in public. Car drivers wait patiently for people to cross the road instead of honking and cutting across. When a car is waiting, other cars line up behind the first one and wait patiently instead of breaking the line and creating chaos. There’s no traffic signal in all of Bhutan. Even during the most crowded time at Thimphu during its Tsechu (festival), not a single car honked. There was zero chaos. People organized themselves very well on their own. Nearly everyone chews areca nuts. Not a single person shouts at another. Everyone is very polite. There’s little to no bargaining. Everyone we came across seemed genuinely happy. Bhutanese people were a pleasure to be and interact with. Drinking is part of the culture. It is common to see people have a peg or two early in the morning along with bananas! Food is very spicy. If you are in Bhutan, you must try Ema Dhatse (chillies and cheese), Kewa Dhatse (potatoes and cheese) and Shawa Datse (mushroom and cheese). You should also try Suja (butter tea), chowmein and channa. Mouth-watering dishes. Slurrrp! Chilies are dried on the roof of every house. Paro and Bumthang valleys are the most beautiful ones in all of Bhutan AFAIK. Punakha Dzong was the most beautiful. 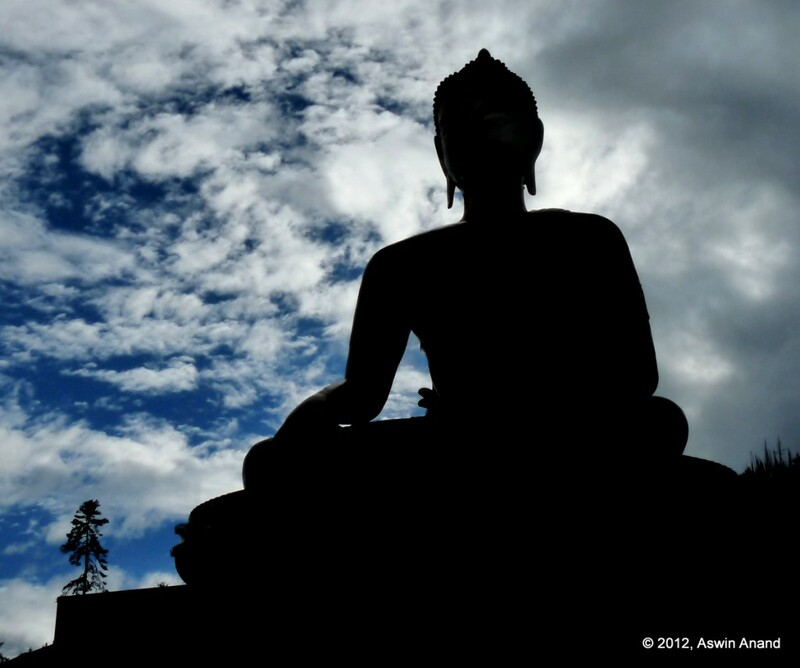 Overall, the experience in Bhutan was that of a very rare one. Something that’s very hard to come by in India except in the beautiful Ladakh. I so wish I could have stayed there for a year or so more and even then, I wouldn’t have had enough. Sigh. One bike trip and a trek is still pending for me in Bhutan, to experience it to the fullest. Thanks a lot Bhutan, for giving me such an amazing experience. I wish I could return to you soon and experience some more of that beauty and grace. Sandeep has asked a few questions in the comments. This update is to answer them. Bike trip is very much possible in Bhutan. Indian bikes can be driven in Bhutan. A permit has to be obtained at the border. Driving licence and other vehicle documents have to be in order (RC book, insurance, pollution certificate etc.). Driving bikes having Bhutanese licence plates with Indian driving licence is not possible. Camping is feasible. But on the routes we went, we didn’t see any campers. There are strict rules regarding hygiene, disposal of human waste etc. For example, on treks, a pit has to be dug to dispose off human waste properly. Hotels are affordable. Vegetarian food is available everywhere. At the very least, maggi noodles will definitely be available. Many people are fluent in English and Hindi. Even more people can understand these languages. There is usually no language barrier. Hindi and English are more than enough. Indians, Bangladeshis and Maldivians do NOT need visa (as per the official Bhutan tourism website). At this time, entry by land into Bhutan is possible only at Phuentsholing. Passport is required to apply for a permit. It takes about 15-20 minutes to get a permit issued. Permit is given for only a week at the border. It can be extended at the immigration office in Thimphu at this road called Norzin Lam. Best time to be there is March-April and September-November. December to February is very cold and May to September is the rainy season. Wowwwww this is awesome !!! Goes to my wish list…hope to visit before my last day !! Hearing of Bhutan always Sounds good to me Ashwin & your Log has again increased the fire in me to be there soon. The best part I like was your “Some Notes” Section. 1. I am planning to do a Bike ride here with my wife. What you feel is doing Camping is feasible there or you suggest to book Hotels. 2. Will I get vegetarian food every where? 4. What is process of getting VISA & Permit to Secure Lands and How much money and time it takes. 5. Best time to be there? Wow. Sounds awesome. Totally enjoyed the post as well as all the pictures. Thanks. superb, nice narration, but why only very few photos for a two weeks trip? @Vasantha: Thanks :). Will be publishing more photos soon.